The website hosting provided by Abbeydale includes email addresses based on your website's domain name, eg. joe@mydomain.com. 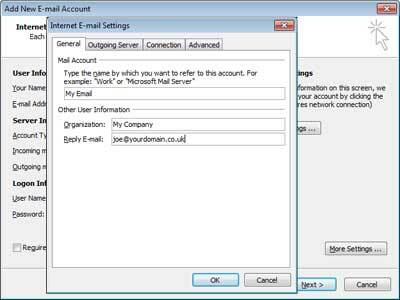 This page tells you how to configure Outlook 2007 to send and receive email via your website's email addresses. 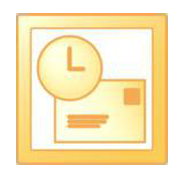 Start Microsoft Outlook 2007 on your computer. Click the 'Tools' menu and then 'Account Settings'. 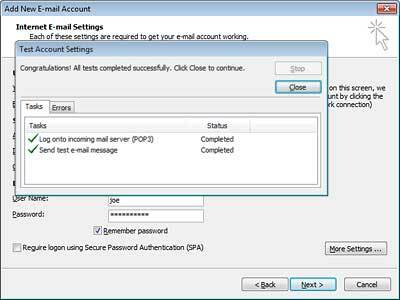 The Accounts dialog lists any email accounts you have already configured in Outlook. 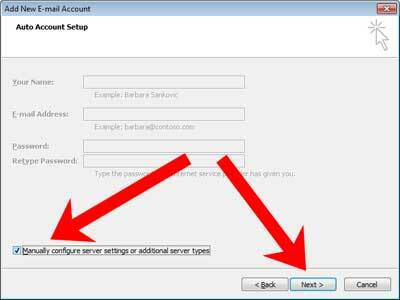 It can handle multiple accounts and lets you chooose a default account to send from or choose a different account for each email if necessary. 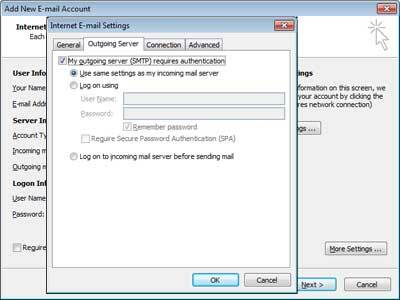 In the New Account dialog the option "Internet Email - POP3, IMAP or HTTP" should already be checked. If not click it. Outlook likes to think it can create an email account with no further help from you but this generally doesn't work! Check the box labelled 'Manually configure server settings...', and then click the 'Next' button. By default the option 'Internet Email' should be selected. If not click to select it. 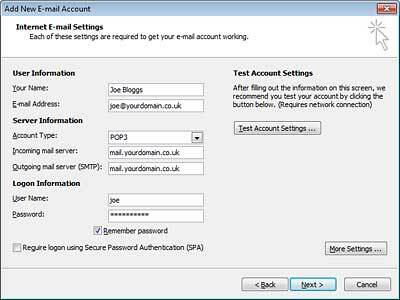 Email address, incoming (POP3) server, outgoing (SMTP) server, username and password: enter these details as you've been given them by Abbeydale. Copy & paste if necessary to be sure they're right. Click the 'More Settings...' button. 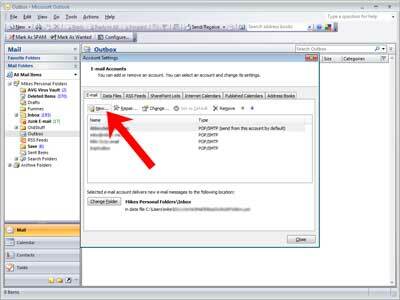 Your website email is different because it works no matter how you're connected to the internet - at home, on holiday, in Starbucks... so Outlook must give your email password when sending email as well as receiving. That's it now - click the 'OK' button. You've not quite finished yet but click the 'Test Account Settings...' button to check what you've done so far. If you don't see two green ticks but get a failed message then either you're not connected to the internet or you mistyped something in steps 6-8 above. Click the 'Close' button and then go back to step 6 and check your entries. 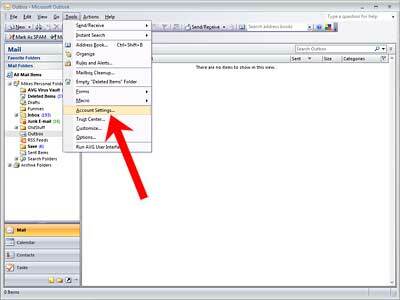 Back at the email settings dialog, you're finished now so click the 'Next' button. That's it. You've successfully configured and tested your new email account. 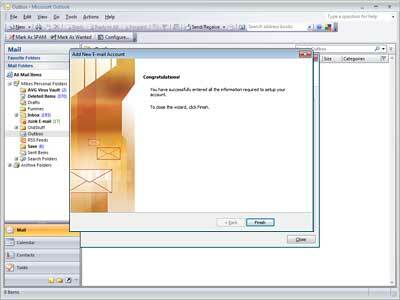 Click the 'Finish' button to return to the Email Accounts dialog. 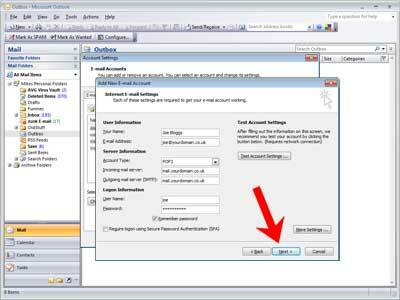 If you have more than one email account you can make the new one the default account for sending email if you wish. Click the new account in the list, to select it, and then click the 'Set as default' button. 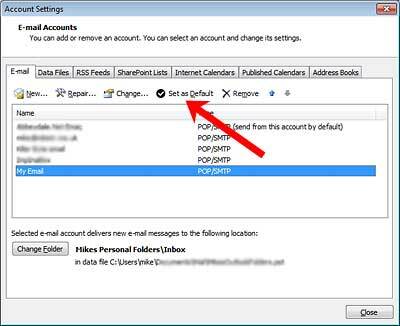 Outlook will use the new account to send email from now on unless you tell it differently. 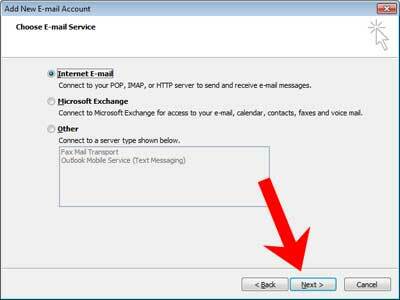 Click the 'Close' button to return to Outlook and start using the new account.